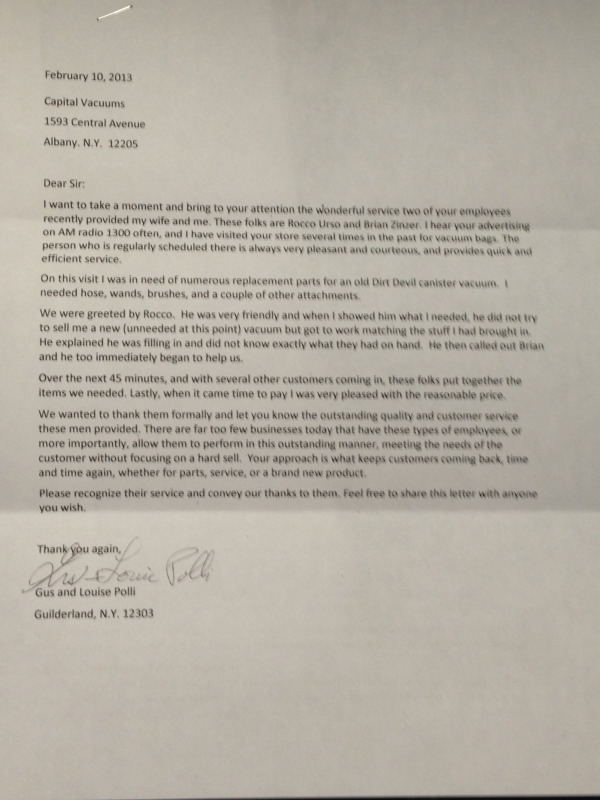 KICKASS Vacuums Customer Service! We get letters! "I want to take a moment and bring to your attention the wonderful service two of your employees recently provided my wife and me. These folks are Rocco Urso and Brian Zinzer. I hear you advertising on AM radion 1300 often, and I have visited your store several times in the past for vacuum bags. The person who is regularly scheduled there is always very pleasant and courteous, and provides quick and efficient service. On this visit I was in need of numerous replacement parts for an old Dirt Devil canister vacuum. I needed hose, wands, brushes, and a couple of other attachments. We were greeted by Rocco. He was very friendly and when I showed him what I needed, he did not try to seel me a new (uneeded at this point) vacuum but got to work matching the stuff I had brought in. He explained he was filling in and did not know exactly what they had on hand. He then called out Brianand he too immediatly began to help us. Over the next 45 minutes, and with several other customers coming in, these folks put together the items we needed. Lastly, when it came time to pay I was very pleased with the reasonable price. We wanted to thank them formally and let you know the outstanding quality and customer service these men provided. There are far too few businesses today that have these types of employees, or more importantly, allow them rto perform in this outstanding manner, meeting the needs of the customer without focusing on a hard sell. Your approach is what keeps customers coming back, time and time again, whether for parts, service, or a brand new product. Please recognize their service and convey our thanks to them. Feel free to share this letter with anyone you wish."